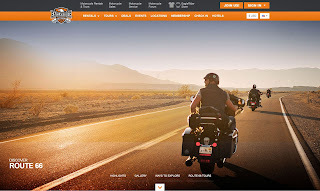 EagleRider, a motorcycle rental agency, recently launched its new Route 66 Experience Portal. The portal offers maps, photo galleries, and highlights of the "Mother Road". The Route 66 Experience Portal is part of EagleRider's initiative to publish detailed motorcycle touring guides. Previously, they've published their "Wild West Tour". Pioneering the motorcycle rental concept in 1992, EagleRider has since extended its branches to become a motorcycle experience industry giant offering services of all kinds to assist and empower motorcyclists and travelers worldwide. Whether you simply would like to try out the motorcycle of your dreams or go on a great adventure in the self-drive and guided tours offered from any one of our beautifully located 100+ locations across the globe, EagleRider offers the world's favorite brands including Harley-Davidson®, Indian®, Honda® and BMW® in motorcycles as well as Scooters, Dirt Bikes, and ATV's. We also provide motorcycle service, parts, and accessories in addition to a vast array of solutions for individuals as well as dealers that are looking to buy and/or sell their bikes.